Last month we went on a whirlwind eating tour in Teluk Intan, covering the famous Liew Kee Chee Cheong Fun (only opens from 5pm onwards, so don’t park yourself there for lunch), Ah Chai Rojak (not as good as some might say), Jalan Maharani decades-old soya bean milk, Ta Sin Guan Tin‘s confectioneries and Lana Tea House (a charming little place for lunch, dinner, and everything in between). That took us about 8 hours worth of travelling, bingeing, resting in-between, and naptime in the car. But if you’re thinking that those are all that Teluk Intan has to offer …. you’re wrong, my friend. Anyway, to make a long story short (hehe, yeah right), we were there for work yesterday morning and ended up having our rushed breakfasts at McDonald’s (no pics though, and I made a blunder by trying to order a Weekday Breakfast Special set priced from RM4.00-RM4.50, when it was clearly a SATURDAY! ), then subsequently our lunch at Steak Factory; a Western diner with Asian influences that spans two shoplots at Rapid Mall in Teluk Intan. Steak Factory is supposedly ‘Halal‘ (sorry I forgot to confirm the status, but definitely pork-free and they claimed to use Halal ingredients), and offers a range of Western cuisine, with minimal choices from the Asian kitchen sandwiched between. 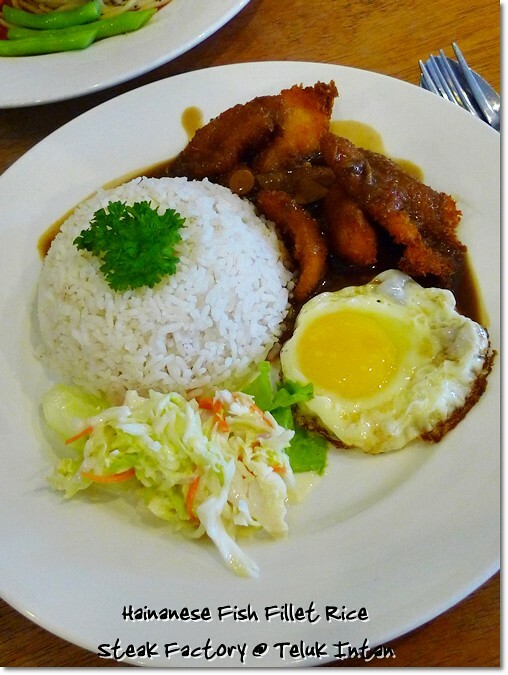 Read on to find out about this place …..
Mushroom Fish Fillet Rice (RM6.90/USD2.10) – Boneless fillets of fish deep-fried then served with their version of mushroom gravy, with a fried egg and coleslaw with rice. KYT had the Mushroom Fish Fillet Rice, priced at a reasonable RM6.90 that came with a fried egg, and some coleslaw on the side. The crumb-coated fish fingers appeared to be over-fried on arrival (darker than they should be) but tastewise, there was nothing much to complain. 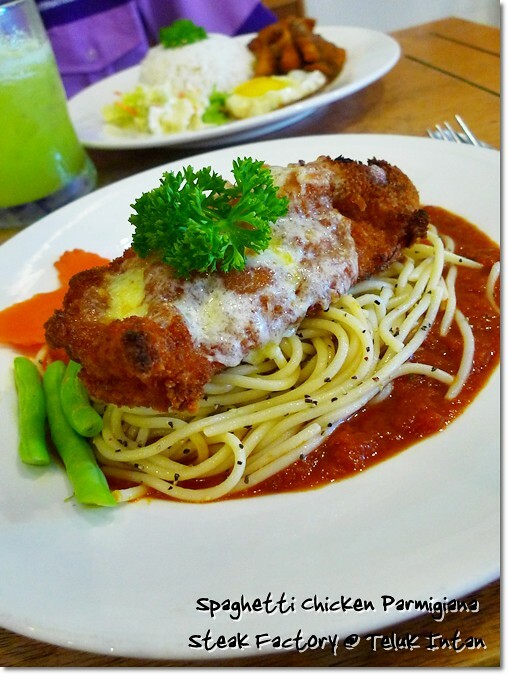 Mr Z chose the Chicken Parmigiana from the pasta section, that also includes everyone’s favourite Bolognese, as well as their signature Cheese-Baked Spaghetti Bolognese. All for under RM10, in case you’re wondering. Though nothing earth-shattering in terms of gastronomic proportions, the Chicken Parmigiana did surprise us when it came in a rather hefty portion; seated on top of a swirl of spaghetti in Bolognese sauce. The sides of blanched vegetables completed the whole ensemble that was rather filling. 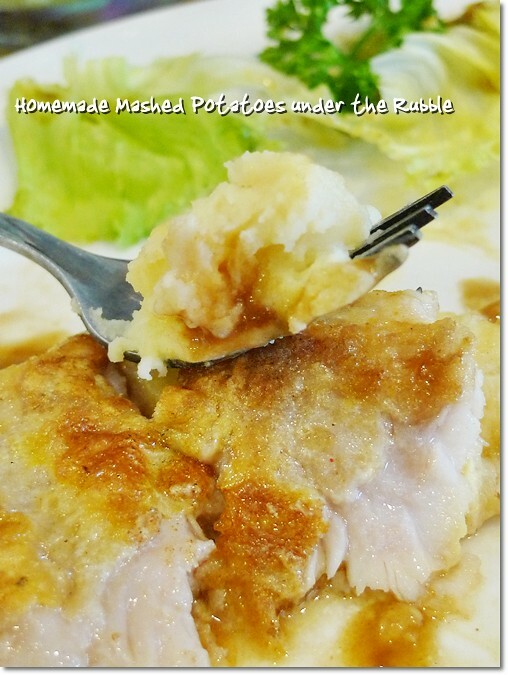 The lightly sauteed fillet of cream dory arrived perched on top a pool of mashed potatoes. And it was the potatoes that really shone in this one. Definitely not something that came out of a can, nor made from the powdered form/artificial manner, the luscious, slightly buttered mashed potatoes got me licking my plate clean. Oh, how’s the fish you ask? It was okay, not reeking of the muddy, earthy undertone commonly associated with dory fish. But nothing spectacular either. I’ll give this a 3 out of 5. Moreover, it’s a steal for the price of RM12.90 per portion. The mashed potatoes was the real highlight of this dish. 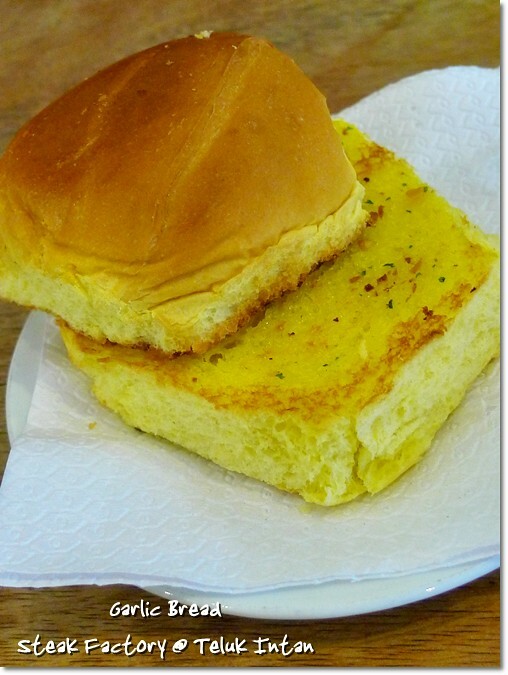 And the Garlic Bun that came in an unconventional form; rather than served with baguette, a whole bun was used. Not too shabby either, for RM2.20/USD0.90 each. 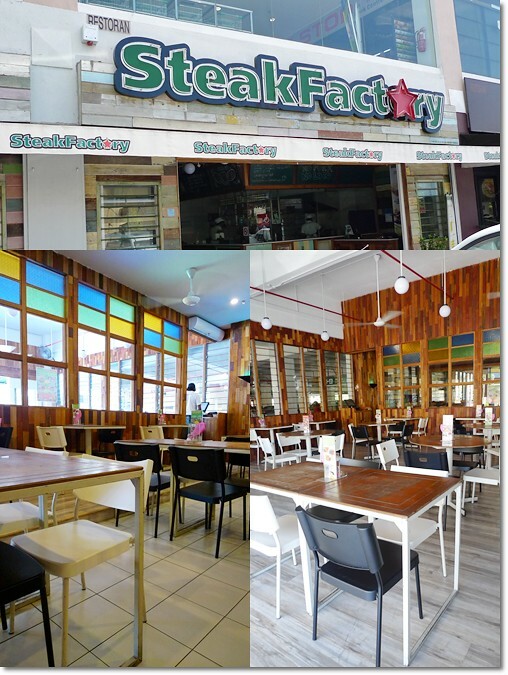 Steak Factory holds the potential to be Teluk Intan’s best choice when it comes to respectable Western diners. There are a few more in town, in particular the stretch of, and lanes off Jalan Sultan Abdullah. Lana Tea House, Mushroom Cafe (correct me if the name’s wrong) and Rose Garden Restaurant are all located within the vicinity of each other. Some hits, some misses. But we shall be back for more of Steak Factory’s offerings, especially when we have had too much of Gulam Rasul’s nasi kandar on Jalan Changkat Jong (sorry, no post from me … but you can find the place easily as it’s on the main road leading to Teluk Intan town), and I don’t really know what to eat for lunch in Teluk Intan anyway. Recommendations, people? ** Rapid Mall Seri Intan has a Facebook page as well. Been to Teluk Intan once only…. didnt know where to eat too.. just went there to buy some heong pian, looked around and then drove back.. lol.. crazy then..
Haha .. you can try the many hawker fares in town, or the stretch of Malay nasi kandar at Gulam Rasul, Changkat Jong etc. Mastan Ghani Mee Rojak is another good bet, with many branches in TI alone. Do you tried the fast selling lunch time fried chicken of Nasi Kandar Changkat Jong (locally known as Restoran Krishnan or Bawah Pokok) at Jalan Changkat Jong, Teluk Intan before? This is one of the best fried chicken ever that you are going to taste when you want to have a lunch. Hi lolento, yup I did notice that the Nasi Kandar Changkat Jong is very famous, and packed come lunch hour. Just that the Malay colleagues seem to prefer Gulam Rasul for some reasons. I will try the Nasi Kandar Changkat Jong someday. Thanks. There is another place to have Western diners call P&S Cafe. It is located at Jalan Laksamana. It is just opposite the Balai Bomba dan Penyelamat Teluk Intan. The chops there are very cheap and big in size. Go and have a try there for your next trip. Oh thanks lolento. There’s an Al Fresco also, on Jalan Changkat Jong. Looks to be rather exclusive, but never opened for lunch. Do you mean the Al Fresco that same row with Tai Chong Restaurant? There is also a nice kopitiam located at Sungai Nibong call ????. The famous food at there are Mee Rebus and Curry Mee. It is also very cheap in price and lot of people having their breakfast and lunch there. It open daily from 6.00am – 3.00pm. Aiyar….sorry…..don’t know this blog can’t put chinese word. The “??? ?” is “Ah Hua Cha Shi”. Yeah, the Al Fresco same row with Tai Chong. You been there? Sungai Nibong in Penang you mean? If not mistaken, the management of the Al-Fresco is same with Tai Chong Restaurant. You can order Tai Chong Restaurant foods and eat at Al-Fresco. I have not been there before but I heard from my friends that you can have your western dining like steaks, chops, pasta, pizza and etc. at Al-Fresco. There also sell alcohol. The foods there are at an affordable price. It is only open after 5pm daily. No. Sungai Nibong is located at Teluk Intan. It is located near San Min (SUWA) Teluk Intan. Penang that one is Nibong Tebal. haha!!! Al-Fresco do have license to serve cocktail as well. 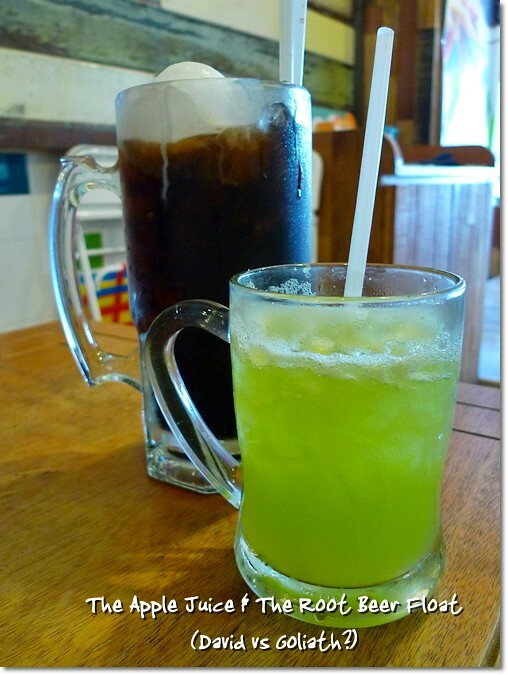 I guess it is the only place in Teluk Intan that serves cocktail and they have Carlsberg draught too. No steak for us that afternoon. I was not sure of the quality of the food, hence we refrained from ordering beef. Anyway, their steaks are rather cheap, at less than RM20 each only. Hi lolento, thanks. Yeah that’s the same Al Fresco that I was talking about. Only for dinner? No wonder it’s perpetually closed in the afternoons. It’s the area with the Penang main bus station, near Sungai Dua. Ya……..they only open after 5pm onwards daily and don’t offer lunch. 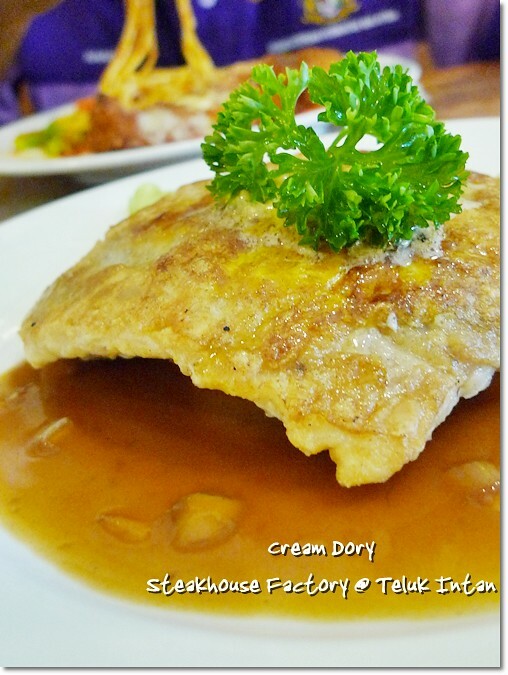 the cream dory looks delicious! Not sweet, it’s slathered with garlic butter then toasted. so wheres the steak? or was it only just chicken and fish steak? hehe. LOL. You can refer to my reply to lolento’s comment above. For a place named Steak Factory, they only have but a few items. And all priced below RM20 at that. Cheap eh? But you can rest your thoughts on having the most tender cuts, or premium beef here. I love how cheap, uhm i meant affordable food still in there. And in such a lovely looking ikea decorated cafe no less. I’m thoroughly impressed! IKEA decorated?! Wait … I myself did not notice this. But the design did seem more appealing than say, the usual steel tables and chairs. One hawker stall down the soyabean stall in Jalan maharani. Opens after 6.30pm till 8pm. The curry mee is good with all the ‘liew'(nothing to shout about though} the chee cheaon fun with mushroom sauce is worth trying too. Close on thursday and sunday. I wanna know the Glutton Square (wai sek kai?) is opened for dinner only? Or throughout? I missed the fried chicken from the old wai sek kai. Glutton Square is opened from morning until night….BUT the fried chicken stall is open only after 6.30pm…. There is one fried chicken stall in Langkap opens for 2 hrs only. from 1pm till 3pm. I think is better but is 20km away from Teluk intan. Oh, which part of Langkap? I am supposed to go Langkap soon. You have any idea where is the famous Langkap pau? the road from kampar to Teluk Intan. Just on the left side there are a row of stalls somewhere in the middle of the stall. Stop there and ask anyone! U can ask the lady where is the Langkap pau! Mushroom cafe ? Haha, It’s called Shiitake Cafe. Steak Factory is one of the best western food you can get in Teluk Intan. P&S, the one your commenter mentioned is defnitely more economical but taste wise, not satisfying at all. Oh Shiitake …. Hahaha, you got me there. But still, mushroom ma. Thanks for the clarification. You’re from TI yourself? Yup, I’m from TI 😀 I love it when bloggers blog about my hometown. Haha … I can understand that. I love it too when people write about Ipoh, or even Perak in general. went there today from sitiawan….but its closed…they stop doing business edy?? Sorry baby … I have not been there for a long time. After moving away from Ipoh in 2010 in fact. too bad this shop has closed down and been replaced with Domino’s Pizza =( …….wondering where can get nice western steak @ Teluk Intan??? Oh they have closed? Thank Adam for the notice. I guess only Lana Tea House?